More than 100 evacuation sites designated by local governments were swept away or inundated by the tsunami triggered by the March 11 earthquake just off the Tohoku region’s coast, according to a tally compiled by Kyodo News. Many people are thought to have lost their lives after fleeing to those sites, believing they would be safe, but no data have so far been collected on the death toll at those places. There have been no moves so far among citizens to hold local governments responsible for designating those sites, apparently because the scale of the tsunami was beyond what had been foreseen. But calls will likely grow for a review of locations of evacuation sites along coastal regions. Municipalities throughout the country had picked around 70,000 such sites as of April 1, 2008, according to the Fire and Disaster Management Agency. At least 101 designated sites were hit by the disaster in Iwate, Miyagi and Fukushima, the three Pacific coast prefectures struck hardest by the gigantic waves after the quake, according to the tally. Local governments in Fukushima Prefecture have not been able to grasp the extent of damage because the ongoing crisis at the crippled Fukushima No. 1 nuclear power plant has made it difficult to conduct research in the area around the plant. The sum of tsunami-hit evacuation sites may well thus rise further. 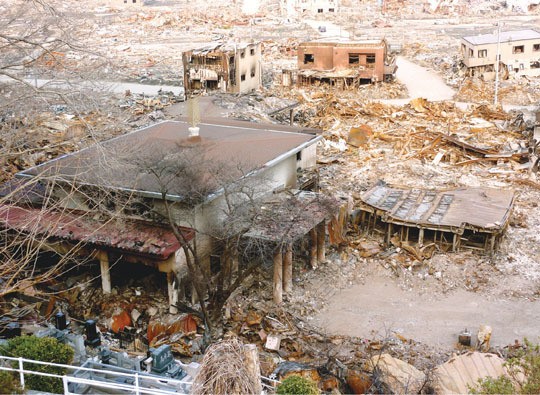 In Minamisanriku, Miyagi Prefecture, for instance, 31 of its 80 designated sites were hit. “Most of them were washed away,” said an official. In the same prefecture, Onagawa’s 25 sites were set up at locations at least 6 meters above sea level, a lesson the town learned from the major tsunami that reached the region after the 1960 Chile quake. The March 11 tsunami, however, smashed 12 of the 25 sites. In Iwate Prefecture, the city of Kamaishi had four of its 69 sites damaged and the city of Ofunato six of its 58 sites. 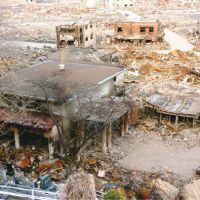 In the town of Yamada, public buildings were wiped out by the tsunami and fires, leaving at least a dozen people missing. Local governments designate sites for evacuation from tsunami and quakes. Many are public structures such as elementary and junior high schools or local assembly buildings, as well as shrines and temples. Some are upland parks or vacant land lots. In Otsuchi, Iwate Prefecture, Koganji Temple, located just under 1 km from the shore, was a designated evacuation site. The temple survived the big tsunami of 1896 and had held a disaster preparedness drill just one week before the March 11 tsunami. On March 11, neighbors gathered after a tsunami warning was issued. Deputy chief priest Ryokan Ogayu, 52, and his wife, Tomoko, directed people to move farther upland at the temple entrance gate but the temple was soon swallowed by waves. The couple were eventually rescued but their 19-year-old son, Hiroumi, and Tomoko’s father-in-law and chief priest, Hideaki, 82, who were with the couple before the tsunami, are missing. There were also 30 others within the temple’s premises, she said. The temple was later hit also by a fire. “We thought it was safe,” said Tomoko, adding that it should be studied why it came to be designated as an evacuation site. If standards for selecting sites no longer fit the reality, they should be revised, she said.